The human prion disease, Creutzfeld-Jacob, is diagnosed by a variety of criteria, including clinical features, electroencephalograms, and magnetic resonance imaging. Until recently there was no non-invasive assay to detect PrPSc, the only specific marker for the disease. This challenge has been overcome using amplification procedures to detect Creutzfeldt-Jakob prions in nasal brushings and in urine. These assays utilize two different methods for amplifying the quantity of prions in vitro. In real-time quaking-induced conversion, PrPC (produced in E. coli) is mixed with a small amount of PrPSc. The mixtures are subjected to cycles of shaking and rest at 42°C for 55-90 hours, which leads to the formation of amyloid fibrils that can be detected by fluorescence. The assay can detect femtogram levels of PrPSc in brain homogenates from humans with Creutzfeld-Jacob disease. In protein misfolding cyclic amplification, samples are incubated for 30 minutes at 37°- 40°C, followed by a pulse of sonication, and this cycle is repeated 96 times. Prions are detected by western blot analysis after treatment with proteinase K. This process can detect a single oligomeric PrPSC. Two non-invasive assays using these amplification approaches were developed. The first is a nasal-brushing procedure to sample the olfactory epithelium, where PrPSc is known to accumulate in patients with the disease. The real-time quaking-induced conversion assay was positive in 30 of 31 patients with Creutzfeld-Jacob disease, and negative in 43 of 43 healthy controls (a sensitivity of 97%). Furthermore, nasal brushings gave stronger and faster positive results than cerebrospinal fluid in this assay. The high concentrations of PrPSc detected in nasal brushings suggest that prions can contaminate nasal discharge of patients with the disease, a possible source of iatrogenic transmission, which has implications for infection control. Protein misfolding cyclic amplification was used to assay for the presence of PrPSc in the urine of patients with variant Creutzfeldt-Jakob disease (caused by ingestion of beef from cows with bovine spongiform encephalopathy), which had been previously shown to contain prions. PrPSc was detected in 13 of 14 urine samples from patients with the disease, but not in 224 urine samples from healthy controls and patients with other neurologic diseases, including other TSEs. The estimated concentration of PrPSc in urine was 40-100 oligomeric particles per ml. Because Creutzfeldt-Jakob disease is so rare, any assay for the disease must have near-perfect specificity. 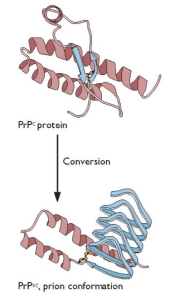 A problem with both cycling assays is that PrPC converts into oligomers and fibrils in the absence of PrPSc. Additional work is needed to address this problem. Nevertheless it is possible that these assays could one day lead to earlier diagnosis and treatments, if the latter become available.